District 68’s 2-day Championship at East Fork Lake in a Stunning Finish. John from Oblong IL is one step closer to the ABA National Championship with a 1st Place win and $730.00 in the American Fishing Tour bass tournament held on East Fork Lake this past weekend . John caught 8 bass that weighed in at 18.96 lbs. Coming in a very close Second place was Matt Bennett with a weight of 18.65 lbs. Coming in a very close third place was Chris Rush with a weight of 18.43 lbs. 4th place was Ryan Fancher with a weight of 17.62 lbs. 5th place was Mike Buchanan with a weight of 16.36 lbs. Big bass of the tournament was awarded to Chris Rush for catching a 5.16 pound large mouth. What an Exciting finish! A half pound is all that separated the top 3 anglers in this 2-day Championship. John Pepmeier’s winning bait of choice was an 11” creature worm made by Net Baits. Matt Bennett Takes the Angler of the Year Title! Matt will fish against the top anglers in a one day winner takes all Angler of the Year event at or near Lake Murray South Carolina. The winner of this event will win a brand new fully rigged Triton Boat. Matt credited his win to his rod sponsor River Creek Rods, which a new 7’6” Rod was also awarded to Matt for winning the Angler of the Year Title. These are great rods and I am personally going to purchase a couple of these as well. Matt also credited his win to his lure sponsor -Wave lures. Matt won the Title using a creature bait made by Wave lures. Chris Rush caught his fish using Lamkin lures. Chris also credited his local sponsor Runyon Oil Tools. WOW ! What an exciting finish all the way around. After DAY ONE John Pepmeier is leading with 12.01 lbs over Chris Rush’s 11.73 lbs. Chris Rush is in the lead for the Angler of the Year title. Going into the championship Matt Bennett and Chris Rush are tied but trailing the current district leader Kevin Arbaugh by 5 positions / places. This is determined by their top 4-single events points. In other words they had to beat the leader by 6 places in order to take the Angler of the Year Title. In a nail biting finish Matt Bennett’s year end points were 1164. Kevin Arbaugh and Chris Rush tied with 1162 points. Conditions: We had great weather this weekend, sunny and 90 degrees. The fishing was tough. We had just two –limits brought in at this two day event. Despite the tough conditions we had 5 anglers that had them figured out. What an exciting year end Event. I want to thank all of our sponsors this year for making all of this possible. Next Tournament: will be the National Championship being help in late October at Lake Murray South Carolina. The Championship is moved from year to year. We have been to Kentucky lake twice, Barkley Lake, Davenport Iowa, Pickwick, Guntersville, Lake Wheeler and Florida as well. In this weeks July 9th American Bass Anglers Event. Chris from Oblong IL is one step closer to the ABA National Championship with a 1st Place win and $393.00 in the American Fishing Tour bass tournament held on East Fork Lake this past weekend . Chris Rush’s 5 bass limit weighed in at a whopping 16.48 lbs. Chris credited his win with his local sponsor – Runyon Oil Tools Second place went to Mike Buchanan with a weight of 14.79 Lbs. Third place was John Jones with a weight of 6.83 lbs. Big bass was also awarded to Chris Rush for catching a 4.94 pound large mouth. Conditions: Water temps ranged from 81-86 degrees throughout the lake. The Air temps were in the low 90’s with a few clouds. The water clarity was about 1’ across the lake. The fish surprisingly were very shallow for the most part. Winning Strategy: Chris caught his first limit in a variety of ways , from cranks to pop’rs. Then He culled all of them out with his trusty jig. Congrats to Chris on having a great day when most anglers struggled to get a limit. 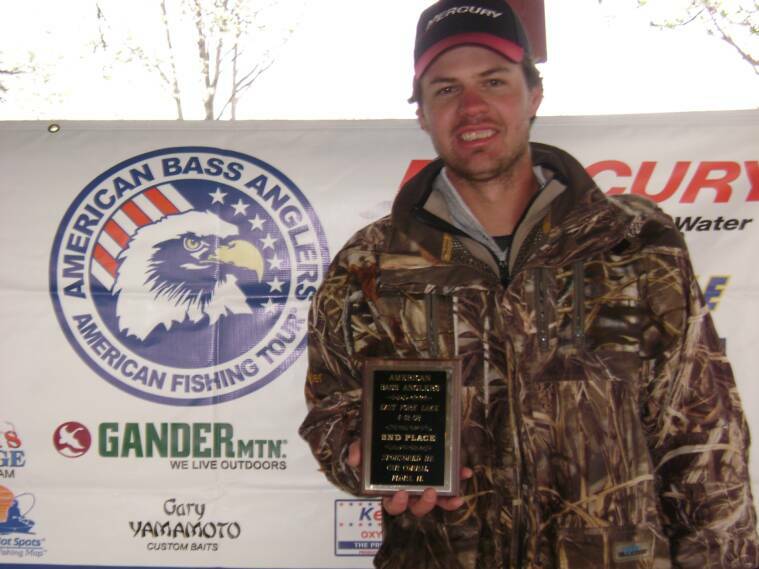 From Division 68 : Brent Budde from Claremont IL is one step closer to the ABA National Championship with a 1st Place win and $449.00 in the American Fishing Tour bass tournament held on East Fork Lake this past weekend . Brent’s 5 bass limit weighed in at 14.22 lbs. Second place went to Ryan Fancher with a weight of 12.32 lbs. Third place was Darrell Knies with a weight of 11.38 lbs. Big bass was awarded to Mike Campbell for catching a 5.12 pound large mouth. Conditions: We started out the day with a light thundershower until about 10 a.m. The lake was heavily stained , possibly from lake turnover. We had very light winds today. Winning Strategy: Brent, caught most of his fish suspended on a main lake point. He caught them, on cranks and swim baits. Fishing was tough for most anglers with even the winners struggling to catch a keeper, still most anglers were able to catch a few fish. Points Standings : The points race has now become a very tight race . We now have 7 anglers within 10 points of each other with Kevin Arbaugh Leading the pack with about a 10 point lead over all. It will be an exciting 2-day event this year with the points winner heading to the Nationals to fish for a new Triton Boat at the angler of the year contest. The deciding points will be awarded at the two day championship on East Fork Lake August 20-21st. Spectators are always welcome at all of our event weigh-ins and this one will be an exciting finish that you will not want to miss. 5/14/11 Kevin Arbaugh Takes First Place at East Fork Lake. 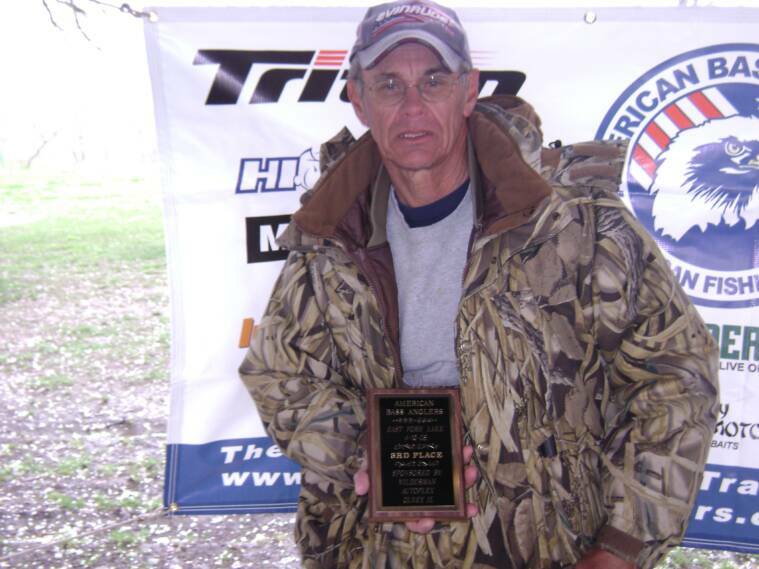 From Division 68 : 5/14/11 Kevin from Olney , IL is one step closer to the ABA National Championship with a 1st Place win and $447.00 in the American Fishing Tour bass tournament held on East Fork Lake this past weekend . Kevin’s 5 bass limit weighed in at 15.76 lbs Second place went to John Pepmeier with a weight of 10.71 lbs a very close third place was Mike Campbell with a weight of 10.61 lbs. Big bass was also awarded to Kevin arbaugh for catching a 3.99 pound large mouth. Conditions: We had a large cold front the night before the event which really either shut the bedding fish down or pushed them out deeper. We had light rains on and off all day. Water temps were around 70 in most areas. Winning Strategy: Kevin’s strategy was keying in on the bedding fish. Ryan from Olney , IL is one step closer to the ABA National Championship with a 1st Place win and $484.00 in the American Fishing Tour bass tournament held on East Fork Lake this past weekend . Ryan’s 5 bass limit weighed in at 16.56 lbs. Second place went to Chris Rush with a weight of 13.36lbs. Third place was Brent Ausbrook with a weight of 13.12 lbs. Fourth place Went To Rick Klanke with a weight of 11.51 lbs. Fifth Place went to Kevin Arbaugh with a weight of 9.43 lbs. Big Bass was caught by Gruen Vonbeherens who boated a very nice 6.22 pound large mouth. Conditions: The weather conditions were very tough to say the least. Winds were 20-30 mph with gusts over 40 mph. Some of the bass have spawned and were guarding but with the lake about 2’ over normal pool there were bedding fish from the buck brush clear to the center of some of the pockets. With the high water and high winds seeing a bedded fish was almost impossible. Still other bass were moving in to new territories to get ready for the spawn so there was lot of transitioning going on. It was a very tough day for most everyone. We had two limits brought in and two people caught 4 fish. On a lake that usually produces large numbers of keepers it was a very tough day. Still there were 2-nice fish brought in over 6lbs and one over 5 lbs. Water temps were about 60 on the main lake and up to 64.5 in some protected pockets. The water was heavily stained on one end with a slight stain from mid-lake to the dam. Winning Strategy: Ryan keyed in on the bedding fish and was able to find enough to make a very nice bag of fish. His fish’s average weight was 3.31 lbs. That’s a really good day by any lakes standards. Next Divisional Tournament: This division’s next tournament will be 5/14/11 on East Fork Lake , take-off at safe light. Mike is one step closer to the ABA National Championship with a 1st Place win and $588.00 in the American Fishing Tour bass tournament held on Coffeem Lake this past weekend . Mike Castelli’s 3 bass limit weighed in at 8.15 lbs. Second place went to Mike Elsea with a weight of 7.06lbs Mike Riggs came in with a very close third place finish of 7.04 lbs. Big bass was awarded to Mike Castelli for catching a 4.44 lb pound large mouth. Conditions: The weather was cool in the morning with 40 degrees starting out but warming to 55 and partly cloudy. Winds were 10-20 mph. The power plant has been shut down for the last two weeks and the water was 48-49 degrees about everywhere. The fishing was tough but all 20 anglers were able to catch fish. Winning Strategy: Mike caught his smaller fish on a crank and caught his Big Fish on a Sweet Beaver. From Division 68 : 3/5/11 Mike from Panama,IL is one step closer to the ABA National Championship with a 1st Place win and $488.00 in the American Fishing Tour bass tournament held on Coffeen LakeLake this past weekend . Mike’s 3 bass limit weighed in at 7.07lbs Second place went to Kevin Arbaugh with a weight of 7.04 lbs third place was Steve Klein with a weight of 6.61 lbs. Big bass was awarded to Steve Klein for catching a 3.62 lb large mouth. Coffeen although tough at times seems to always produce. Every angler at this event caught fish and 16 of the 20 anglers had a limit of Bass. For the weather conditions we had today it was truly amazing the amount of fish caught. Conditions: The Weather conditions were about as bad as you could order up. 15-30 mph winds all day. Rain on and off all day with 40 degrees for the high and dropping temps all day. The water temps were 50 degrees and the fish could be caught but it was tough. For most a crank of some type was the key. There were a few that were throwing jigs and the outcome was about a 50/50 mix. A Crank took 1st with 7.07 lbs and a jig took 2nd with 7.04 lbs. Matt is one step closer to the ABA National Championship with a 1st Place win and $ 575.00 in the American Fishing Tour bass tournament held on Newton Lake this past weekend . Matt’s 3 bass limit weighed in at 12.03 lbs Second place went to Jeff Scott with a weight of 8.96 lbs third place was Chris Rush with a weight of 7.80 lbs. WE HAD A TIE FOR BIG BASS Jeff Scott & John Jones split the Big Bass Award. Both anglers had a 4.80 Bass. These anglers are acquiring valuable points to insure their birth in division’s two-day champion and the American Fishing Tour National Championship that will be held this fall. Their points are also being used to determine the divisional angler of the year. The top angler by points earned in this division will represent the division in the Angler of the Year final round. Conditions: We started out the day with 37 degrees and a 10 mph wind and a steady rain right before take-off. The air temps ended up at 60 degrees with wind up to 20 mph. When the winds get past 10 mph on Newton Lake it’s a rough day. When the winds reach 20 mph its almost unfishable. Winning Strategy: Matt’s winning strategy was a Flat A’ Crank Bait around the wood. Newton Lake Sunday was a little tougher but there was some nice fish caught. there were 2 over 7 lbs that I know of and 2 over 6lbs. My partner and I struggled on the keepers but we caught a lot of fish. We only had 2 keepers and they were 18"-18.5". The bass seemed to be moving up shallow. several times when we set the hook the bass had came almost to the surface before we hooked up. Newton Lake --The 2011 Season is about to kick-off and it looks like we are going to start off with a great event on Newton this coming Sunday the 20th. I fished about 3-hours Sat and although the water temps were cold at the ramp 53 degrees, the fish were still biting. I had 2 nice keepers and my partner caught 3 keepers in a very short time. They were taking it slow so you had to be patient. I caught mine on a jig and my partner was using other things which I better not say for fear of losing a partner. With this weeks warming trend it would not surprise me to hear that the fish start slamming a buzz-bait or a frog by next Sunday. I was surprised that the lake was relatively low on boats yesterday for the warmer day we had. The lake being pressured should not be a factor. Coffeen Lake -- Coffeen has already started off this year with a lot of fish being caught. I know one guy that won an event said he had 63 keepers that day. Sounds like shallow cranks and flukes are the choice as usual. Good luck all ! I will see ya out there. Mike Elsea Is one of our local ABA directors in Indiana. Mike made his first ever trip to East Fork Lake This weekend and had an outstanding performance by bringing in a whopping 27.46 lbs over the two-days. This was an awesome feat for someone that had never seen the lake before that first morning. Mike, Started out his 2nd day in 4th position and was able to move up to take the win. Mike’s first day catch was 12.85lbs and followed that up with 14.61lbs on day two. Mike caught several of his fish on a spinner bait at high noon with the sun shining in the grass. Gruen VonBehrens came in 2nd Place with a very close 26.53 lbs. Matt Bennett came in 4th Place with 22.45 lbs and the Big Bass of the event which weighed 6.22lbs. Rick Klanke Came in 5th Place with 21.85 lbs. Ryan Fancher came in 6th Place with 18.93 lbs. Gruen Vonbehrens actually would have won if he had been able to keep all of his fish alive. His two dead fish was enough for Mike Elsea to take the win. (What a heart breaker for Gruen.) Gruen was sitting in 2nd place on Day one and maintained his position. Gruen had 27.53lbs but his 1 pound penalty took him down to 26.53. Kevin Arbaugh was sitting in 8th place on day one and moved up to 3rd place on day two with another solid catch of 12.19 lbs. Matt Bennett was in the lead with a whopping 17.05 lbs with a big bass of 6.22 and had a tough day on day two as most of us and needed .95 to get back in the money. Going into day two Ryan Fancher needed to just maintain his position to capture the Angler of the Year Title and he had a tough day as well on day two and he brought in two fish. Ryan was sitting in 3rd place on day one and fell to 6th place. I- Rick Klanke,needed my 5th fish to get in the money. I needed 1.55, I was sitting in 7th place on day one and moved up to 5th by the end of day two. Mike Campbell also had a tough day on day two and fell to 7th place. Hugh Bennett, Alvin Pannell and Glen Phegley all brought in 6 fish over the two days and pounded out 8th, 9th & 10th. John Pepmeier who was in 5th on day one, blanked on day two and dropped to 11th place. It was an awesome Championship with a lot of ups and downs and twists and turns. Through all of that these anglers were the most professional that I have ever had a pleasure to fish with. I commend them all for a great event. You will not find a better group of anglers to fish with than a group of ABA Anglers. We had Anglers fishing from 3 different districts from northern Illinois to Southern Indiana. Craig From Division Central Illinois District # 68 on 7-31-10 is one step closer to the ABA National Championship with a 1st Place win in the American Fishing Tour bass tournament held on East Fork Lake this past weekend. Craig’s bass weighed in at 15.54 lbs. Second place went to Rick Klanke with a weight of 13.34 lbs., Third place was Scott Ham with a weight of 12.03 lbs. Ryan Fancher came in a very close 4th place with 11.93 lbs and only 4 fish. Craig also had the Big Bass of the event which weighed 4.55 lbs. This was Craig’s First Win with ABA and He did it with style topping the field by over two pounds. Craig’s partner Scott Ham came in 3rd place. Together with there combined weight they boated 27.57 lbs of fish. That’s a great day! The fish were a little slow on the bite but if you could locate them a limit was very possible. Craig and Scott were out on the deeper grass and drops out in the main lake. I came in 2nd place and I caught mine in the same manner, out on main lake points and the deeper grass. I was using a creature bait and worms to catch my limit. I finally culled my smallest two fish out about an hour before the tourney was over. Conditions: The weather was VERY Humid ! With Heat index in the upper 90’s . It was a beautiful morning with a few light showers. After about 10 a.m. the sun showed up and changed up to humid and hot conditions. The water temp’s ranged from 85-88 degress. Winning Strategy: Craig’s win came from the deeper structure out on the main lake and grass. Next Divisional Tournament: This division’s next tournament will be the championship 8/21/10-8/22/10 on East Fork Lake. Congrats to all and Good Luck ! For more information on this or any future event in this division contact Rick Klanke at 618-665-4158 or by email at: rtklanke@wabash.net. Gruen From Division Central Illinois District # 68 on 7-17-10 is one step closer to the ABA National Championship with a 1st Place win in the American Fishing Tour bass tournament held on East Fork Lake this past weekend. Gruens’s bass weighed in at 5.24 lbs. Second place went to Rick Klanke with a weight of 2.98 lbs., Third place was Jerry Dye with a weight of 1.95 lbs. Gruen VonBehrens had the Big Bass of the event which weighed 5.24 lbs. With a 105 Heat Index today the fish was really tough. Conditions: The weather was VERY HOT ! With Heat index in the 100’s . Mostly sunny with winds at 5-10mph. The water temp’s ranged from 85-88 degress. Next Divisional Tournament: This division’s next tournament will be 7/31/10 on East Fork Lake. Chris From Division Central Illinois District # 68 on 6-26-10 is one step closer to the ABA National Championship with a 1st Place win in the American Fishing Tour bass tournament held on East Fork Lake this past weekend. Chris’s 5 bass weighed in at 15.99 lbs. Second place went to Glen Phegley with a weight of 14.06 lbs., Third place was Ryan Fancher with a weight of 13.65 lbs. Gruen VonBehrens had the Big Bass of the event which weighed 5.12 lbs. Despite the 105 Heat Index today the fish were really biting. 9 anglers brought in limits today. Most of those anglers culled multiple limits as well. It was a great fishing day despite the weather conditions. Conditions: The weather was VERY HOT ! With Heat index in the 100’s . Mostly sunny with winds at 5-10mph. The water temp’s ranged from 81-84 degress. Next Divisional Tournament: This division’s next tournament will be 7/17/10 on Stephen Forbes Lake. We had some very tough conditions for this event but as always we had a few anglers that figured them out. Kevin Arbaugh wins it with a very nice bag that weighed 16.88 lbs. Ryan Fancher also had a nice bag that weighed 14.82 lbs, Coming in an Excited 3rd place finish was Nate Hester with 11.52 lbs. This was Nate's first time placing in a district 68 event and his excitement was truly inspiring. We all forget what its like to win the first time and times like these you can't help but to enjoy the moment. Congrats to all of the winners! The weather was beautiful today . The bass were on the beds. Winning Strategy: Steve’s strategy to take the win from the 19 angler field was was fishing the bedding fish. This was Steve's first win with ABA and he bested the field by a few pounds. Congrats Steve! We had a tough event today there was 24 bass caught with 19 anglers fishing. We had one limit brought in today by Cary Phillips but Ryan Fancher took the winners circle with 11.34 lbs anchored with the big bass of the day that weighed 5.00 lbs. The story of the day was rat-l-traps. If you were not throwing one you were really struggling. Hopefully this warmer weather will help straighten the fish out the next couple of days. Between the wind and the cold snaps it has been a rough year of fishing for most of us. We had a very cold and windy start to Sat. 's ABA on East Fork Lake. There were some nice caught but the bites were unusually slow and far between for this lake. The heavy rains that we got on Thursday found their way into the lake by Sat. and to say it was tough would be an understatement. Three of us had pre-fished on Friday before the event and you could see about 6' deep were we were fishing and catching fish. Of course Sat everything changed water clarity was about a foot at best and I cuaght my one and only fish on the first cast of the day. It was a great fish a 6.35 lb. It had beautifull colorings and markings from the long winter and was very healthy. But after that I went the entire day without another fish. The weather was a huge factor today. The cold front that came in and the winds that came with them were relentless today. I fished into the wind the entire day other than an hour or so break we took to fish a pocket. My partner Lee was great today. Despite the heavy winds and lack of fish we caught it was still a good day in the end. We both weighed fish. The wind just made you feel like you were in a blender all day. We had 28 anglers that took to the water today. Kevin Arbaugh came in 1st place , he caught some deep and some shallow. He had 4 fish all in the 2-5 lb range. Scott Ham came in 2nd place. He caught three nice fish that weighed 9.74 he also had one over 5 lbs. Glen Phegley was the only angler that was able to catch a limit this week. Glen Came in 3rd Place with 9.52 lbs. Mike Black came in 5th place with 7.07 lbs. Rick Klanke came in 6th place and had the Big Bass of the event that weighed 6.35 lbs. The fish are actively starting the beddin process now. Despite the local rumors of fish fanning on the beds this was not the case. The bass were up on the beds but had not dropped eggs or started the fanning process yet. We did not have one fish brought in that had been fanning a bed. the next couple of weeks should be exciting at Newton. By then the bass will be locked on the beds and guarding. The largest group that spawn should go on this next moon. Two things that have really played havoc over there this year is the water temp fluctuation which messed up the first spawn time at the warm arm when the water temp dropped as much as 16 degrees. This next spawn may also get hampered some as well since the plant is dropping lake water levels to fill a cooling pond. the lake has dropped about a foot or better so far. This may again suspend some spawning activity as lake levels drop. The Bite at Newton is starting to heat up. Its still been a little on the tough side but the last week or so the bigger fish have really started moving up. We fished a buddy event last week which we really should have won. We had the winning fish on but either broke them off or lost them. The bigger fish seemed to move up on the shallow flats late in the day 5'-6' deep. They seemed to really stack up on the flats that had deep water near by. The bite was slow. they seemed to want a very slow presentation. Shaky heads seemed to work the best. I really regret not throwing a rat-l-trap on those shallow flats at the end of the day. that might just have been the key to getting a more aggressive strike. There were some fish very shallow. Some almost had thier backs out of the water but they seemed the less agressive. From Division Central Illinois District # 68 on 2/7/10. Mike is our local Indiana visiting director and is one step closer to the ABA National Championship with a 1st Place win in the American Fishing Tour bass tournament held on Coffeen Lake this past weekend. Mike used a jerk bait the entire day to catch his fish. Mike’s 3 bass limit, weighed in at 5.78 lbs. Second place went to Steve Klein from Sorento, IL with a weight of 5.64 lbs. Third place was John Wright from Shelbyville, IL with a weight of 5.51 lbs. Mike Elsea also had the Big Bass of the event which weighed 2.95 lbs. From Division Central Illinois District # 68 on 1/31/10. Mike from Toledo, IL is one step closer to the ABA National Championship with a 1st Place win in the American Fishing Tour bass tournament held on Coffeen Lake this past weekend. Mike’s 3 bass limit, weighed in at 6.21 lbs. This was Mike’s first ABA event and he had an exciting one , beating out a full field of anglers despite the low air temps at launch time ( 14- degrees) Second place went to Gruen VonBehrens from Stewardson, IL with a weight of 5.80 lbs. Third place was Jack Floyd from Hillsboro, IL with a weight of 5.48 lbs. 4th place went to Steve Klein with a weight of 5.24 lbs, Ryan Fancher had the Big Bass of the event which weighed 3.68 lbs. Conditions: The weather was Bitterly cold at take-off this weekend. But with the sunshine it warmed to 36 degrees by days end. The winds were 7 mph. I actually broke ice to put the boat in this morning. The water temp was 38 degrees at the ramp 41 mid lake and up to almost 60 in the hot ditch. The water was slightly stained but near perfect for fishing. ( just cold) Despite the cold 19 of the 21 anglers caught fish today! Hey all it looks like we are in for some more cold temps Sunday but with Sunny skies so hopefully the fish will cooperate. Right now with the calls I have had it looks like we should have a full field of anglers. From the sounds of things Jerk baits, crank baits and shaky heads were the rule at last weekends tournament. I have not been to coffeen yet myself but from last weekends results the fishing must be pretty good. Hopefully we all can get a limit as well. good Luck all ! See ya Sunday! I fished Newton today and in a word it is Tough! Mike Black won with 4 nice fish that weighed right at 20 lbs. I fished all day and we produced 2 small fish and had maybe 5 bites. The lake has muddied up some and a few fish were caught very shallow. I saw 3-caught on a buzzbait. The fish seemed scattered at best. Hopefully in the next few weeks it will pick up? Congrats to Larry Pierce # 34 and Matt Bennett #33. The only two that received checks. Also on the 2nd day Mike Buchanan and I went as observers in the Angler of the Year contest. ( It rained /poured most of the day.) Kevin fished as our angler of the year and did very well but one of the guys hit the jackpot and landed 22 lbs of smallmouth. On day 3 we decided to launch out of the far end of the lake and decided to take the Nachez Trail to get there. (Just a note here if you turn the wrong way you will end up in Mississippi before you realize it) You also will be the last one at the lake to launch. We decided if your lost you must be on the Nachez trail. On day 4 Kevin decided to see how far a boat could fly over a rock pile. At 70 mph it seems he thought it would go pretty far. It will actually roll and spin quite a few times as he reported. Luckily he was not hurt in the ordeal and his boat would still float. He lost the lower unit and half the manifold housing leading up to the engine. There was also quite a bit of damage to the boat and I suspect there is more that we had not detected since the boat was stressed enough to pop loose all the hinges holding the lids. All –in all we were all very lucky that nobody was hurt and everyone made it back home safe. By the way we all decided to rename the island where Kevin crashed as Arbaugh island. Its located right beside the Nachez bridge. Its amazing you can go for a week of sleep deprivation like this and I am already looking forward to next year. I for one had a blast this year. I laughed at times until my sides hurt. All in all I drew a couple of very good partners and would be happy to draw them again any day of the week. Name Service Boat Fish Weight Penalty B/F Day-1 Day-2 Day-3 Total Pts. Paris Landing, Tennessee > Ky lake. For 2010. I do not have the date yet other than it is suppose to approximately the same time. Nationals this year on Pickwick lake in Alabama! Yeagley, John Pepmeier, Mark Kintner, and myself. morning the first day of practice. Good luck all!! From Division Central Illinois District # 68 on 8/15/09 & 8/16/09. Kevin from Olney, IL is one step closer to the ABA National Championship with a 1st Place win in the American Fishing Tour bass tournament Championship held on East Fork Lake this past weekend. Kevin’s 10 bass limit, weighed in at whopping 37.32 lbs. Kevin also had the two big bass of the event that weighed 5.76 and 4.51 lbs. Second place went to Alvin Pannell from Indianapolis, IN with a weight of 25.90 lbs, third place was Mike Buchanan from Robinson, IL with a weight of 21.55 lbs. 4th place went to Gary Bettis of Olney, IL with 20.75 lbs. Kevin ruled the event when he found a group of large fish on a brush pile that weighed in at an amazing weight of 21.64 pounds on day one and he backed it up with a 15.68 lbs on day two. With this weight and his 394 points earned Kevin Arbaugh is going to be representing our district in the Angler of the Year contest in late Sept that will be held on Wilson Lake. The winner of this contest will receive a brand new Fully rigged Triton Boat. 4. Gary Bettis 20.75 lbs. Next Tournament: The Next event will be the Angler of the Year contest in Late Sept. with the National Championship starting the day after. For more information on this or any future event in this division contact Rick Klanke at 618-665-4158 or by email at: rtklanke@wabash.net. From Division Central Illinois District # 68 on 8/9/09. Mike from Robinson, IL is one step closer to the ABA National Championship with a 1st Place win in the American Fishing Tour bass tournament held on East Fork Lake this past weekend. Mike’s 5 bass limit, weighed in at 15.89 lbs. Second place went to John Jones from Olney, IL with a weight of 13.24 lbs. Third place was Brian Maus from Willow Hill, IL with a weight of 12.24 lbs. Brian also had the Big Bass of the event which weighed 4.38 lbs. 4th place went to Kevin Arbaugh of Olney, IL with 10.57 lbs. From Division Central Illinois District # 68 on 7/25/09. Mike from Belleville, IL is one step closer to the ABA National Championship with a 1st Place win in the American Fishing Tour bass tournament held on East Fork Lake this past weekend. Mike’s 5 bass limit, weighed in at 12.17 lbs. Second place went to Jeff Scott from Sumner, IL with a weight of 12.08 lbs, 3rd place was Mike Buchanan from Robinson, IL with a weight of 11.72 lbs. 4th place went to Ryan Fancher of Olney, IL with 10.57 lbs. Conditions: The weather was beautiful this weekend. We had heavy cloud cover almost all day. The winds were 10-15 mph. the air temps hovered around 80 degrees. The Division Championship > 8/15/09 and 8/16/09 on East Fork Lake. The points race for Angler of the Year is very tight. We have five anglers within 7 points of each other so it is going to come down to the final day at the divisional championship. Jeff Scott now has the lead with 793 points. Kevin Arbaugh and Mike Buchanan both have 791 points, Rick Klanke has 789 points, and Ryan Fancher has 786 points. Congrats to all and Good Luck ! From Division Central Illinois District # 68 on 6/27/09. Mike from Mt. Vernon, IL is one step closer to the ABA National Championship with a 1st Place win in the American Fishing Tour bass tournament held on Rend Lake this past weekend . Mike’s 5 bass limit weighed in at a Whopping 19.54 lbs. ( This is also the Largest bag of fish caught at a District # 68 event this year. ) Second place went to Kevin Arbaugh from Olney, IL with a weight of 9.01 lbs, third place was John Jones from Olney, IL with a weight of 6.66 lbs. John also had a very nice big bass which weighed 5.11 lbs. Conditions: The word was HOT!!!!! We had 105 heat index by noon today. Conditions were tough to say the least but amazingly, Mike Pitchford was not only able to get a limit but catch the largest bag for the entire year in those conditions. Hats off to you Mike that was awesome ! The water was heavily stained from the recent rains but if you got your bait in front of a fish they would attack it ferociously. Winning Strategy: Mike’s strategy was fishing a shaky head on a spinning rod near the deeper water at some of the main bridges. I had an opportunity to watch Mike catch several of his keepers. ( He was culling by 7:00 a.m.) Let me just say that Mike definitely had the touch. I was fishing the same bridge Mike was early in the day and I watched him cull several. I boated one short fish on that same bridge. For more information on this or any future event in this division contact Rick Klanke at 618-665-4158 or by email at: rtklanke@wabash.net. From Division Central Illinois District # 68 on 5/9/09. Rick from Louisville, IL is one step closer to the ABA National Championship with a 1st Place win in the American Fishing Tour bass tournament held on East Fork Lake this past weekend . Rick’s 5 bass limit weighed in at 15.25 lbs. Second place went to Mike Buchanan from Oblong, IL with a weight of 14.84 lbs, third place was Kevin Arbaugh from Olney, IL with a weight of 14.04 lbs. Mike Buchanan also had a very nice big bass which weighed 6.68 lbs. Conditions: The air temps were great 72 at take off and 84 by days end. The weather was great today, sunny most of the afternoon and 84 degrees. The water was near perfect in color. Winning Strategy: Rick’s strategy was fishing the weed beds nearer the deeper water. I caught most of my fish in 15’ water but the the weeds were 6’ to 8’ tall. A light weight was the key I think. I went to a very light weight so that my bait would sit-up on top of the weeds and not sink down into them completely. Next Divisional Tournament: This division’s next tournament will be 6/27/09 on Rend Lake at the Sail Boat Harbor boat ramp. From Division District # 68 Central Illinois 5/10/09 Mike from Robinson , Il is one step closer to the ABA National Championship with a 1st Place win in the American Fishing Tour bass tournament held on Borah Lake this past weekend . Mike’s five bass limit weighed in at 10.21 lbs and were caught using buzz baits Second place went to Bob Long with a weight of 10.15lbs, third place was John Jones with a weight of 7.24 lbs. Big bass was awarded to Gary Bettis for catching a 3.45 lb pound large mouth. These anglers are acquiring valuable points to insure their birth in division’s two-day champion and the American Fishing Tour Championship that will be held this fall. From Division District # 68 Central Illinois 5/9/09 Ryan from Olney , Illinois is one step closer to the ABA National Championship with a 1st Place win in the American Fishing Tour bass tournament held on East Fork Lake this past weekend . Ryan’s five bass limit weighed in at 14.37 lbs Second place went to Kevin Arbaugh with a weight of 12.55 lbs., third place was Bob Long with a weight of 11.91 lbs. Big bass was awarded to Ryan Fancher as well for catching a 3.89 lb pound large mouth. It was a great event this weekend. We had 12 of the 17 anglers that boated 4 fish or more and 9 anglers had a limit. We had a great turnout today for the Crawford County Bass Anglers Youth Event. There were some limits of bass caught and every young angler had fish to weigh today. The pictures are posted for this event on the 2009 pictures page. Thanks to all for their support and help making this such a great event. East Fork is starting to really heat up this year. There have been several large fish caught recently and this past Thursday nights evening tourney was just on fire. We launched at 6 p.m. and by 7p.m. We had already culled 6 times and had 15.41 lbs. I am not really sure how many more keepers we caught. none were larger than what we had so we just kept tossing them back. We caught them on everything from a buzz bait to a jig. The jig bite was definitely the best though. I think almost every boat had a limit Thursday night. It was some of the best fishing I have seen in a very long time. This Saturday's Youth tourney with Crawford County Bass Anglers should be just down right fun. From Division Central Illinois District # 68 on 4/26/09. Kevin from Olney, IL is one step closer to the ABA National Championship with a 1st Place win and $484.00 in the American Fishing Tour bass tournament held on East Fork Lake this past weekend . Kevin’s 5 bass limit weighed in at 16.02 lbs. Second place went to John Travis from Olney, IL with a weight of 11.63 lbs, third place was Mike Buchanan from Robinson, IL with a weight of 11.24 lbs. Fourth Place went to Brian Maus from Willow Hill, IL with 11.21 lbs. Kevin Arbaugh also had the big bass of the event which weighed 4.92 lbs. We had 21 anglers that took to the field today. Conditions: The air temps were great 62 at take off and 84 by days end. The winds were the key ingredient today the winds were gusting up to 30 mph today but it was not a steady wind it was swirling back and forth. The fishing was very tough today to say the least. The fish have started moving into the spawning cycle and were quite shallow but still most anglers were able to catch a few fish. East Fork Lake, IL is an amazing fishery that continues to produce year after year. Winning Strategy: Kevin’s strategy was using a swim bait over the bedding areas. It was a tough day at the Miller lite event for most but there were some good limits of bass caught. The winners had 16.50 lbs. I struggled with a lot of short fish today myself and ended up with 4 fish , 1 short of the limit. My partner and I had our chances, we lost a lot of fish today that probably would have put us up in the pack. The bucks are busy all over the banks and the females seen to be suspended over deep structure near the banks. I fully expect that there will be a huge number of bass on the beds this next weekend. Crawford county Bass club had an event this Saturday and the bigger fish are definitely starting to bite. We had 4 over 6 lbs bought in today and one really nice 7.52 lb bass as well. The bass are still biting slow but several limits were caught today. almost all were taken deeper than 8' today but I did catch one in about 2' of water on a jig. I had other anglers tell me they had caught a few shallow as well. I think that next weekends Miller lite event is probably going to be a turkey shoot. Fish are being caught in a wide range of ways and depths. There is distinct mudline that is traveling down the lake from the St.Marie road and this may play a big factor into next weekends event as well especially if we get more rain. Good luck all !! Terry Cordum Takes First Place at East Fork Lake ! From Division District # 68 Central Illinois 4/4/09. Terry from Maryville, IL is one step closer to the ABA National Championship with a 1st Place win and $611.00 in the American Fishing Tour bass tournament held on East Fork Lake this past weekend . Terry’s five bass limit weighed in at 13.35 lbs and were caught using 5 different lures, ranging from a rat-l-trap to a jig to a shaky head worm. Terry over came 30 anglers today to take this win. He not only had the only 5 bass limit of the event but this was Terry’s first time of ever fishing at East Fork Lake. Second place and $380.00 went to Ryan Fancher from Olney, IL with a very close weight of 13.20 lbs with 4 fish. Third place and $141.00 was Kevin Arbaugh from Olney, IL with a weight of 8.82 lbs. Fourth place was Alvin Pannell from Indianapolis , IN who was fishing his 2nd tournament on East Fork and Al had 8.44 lbs and the Big Bass of the event which weighed 5.08 lbs. Alvin also had Anglers advantage insurance and was wearing his AAIP patch which will earn Alvin another $100. Alvin earned a total of $360.00 for 4th place, Big Bass and having Anglers Advantage Insurance and wearing his A.A.I.P. patch at the weigh-in. Fifth place went to Rick Klanke of Louisville , IL with 6.71 lbs. Congrats to all ! The fishing was very tough today to say the least. We have had cold fronts and large amounts of rain here that had dropped the water temperature about 5 degrees in the last two weeks. And still most anglers were able to catch a few fish. East Fork Lake, IL is an amazing fishery that continues to produce year after year. These anglers are acquiring valuable points to insure their birth in division’s two-day champion and the American Fishing Tour Championship that will be held this fall. With the full fields of anglers we have had the District 68 Angler of the Year title is still wide open. With 7 one day events left to go this year it is still possible for someone to pull off that perfect score we all strive for. Kevin Arbaugh and Kerrie Shultz take 1st and 2nd place in the Crawford county club event on 3/28/09. Kevin had 17 lbs and was followed closely by Kerrie Shultz. The fishing was tough at best but the 7 hours of rain we had today made the fishing outing miserable. I caught several fish today but had mostly short fish. We tried to fish the points but the wind made that endeavor almost impossible. I did catch some on a deep crank over the brush piles as well as jigging. We tried the spinnerbait out as well but did not even have a short fish. The fish seemed to be suspended out about 8' deep for the most part. 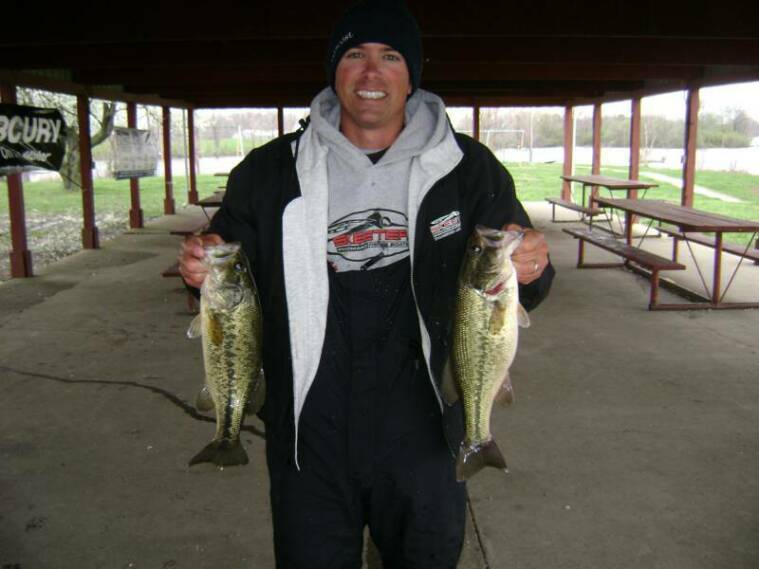 John fought off 30 other anglers today to take the win during the 3/21/09 District # 68 event in Central Illinois. John from Olney , Illinois is one step closer to the ABA National Championship with a 1st Place win in the American Fishing Tour bass tournament held on East Fork Lake this past weekend . John’s five bass limit weighed in at 17.21 lbs and were caught using a Jig in the grass and brush piles. John also used a jerk bait and a rat-l-trap at times to catch his fish. Second place went to Jeff Scott with a weight of 16.48 lbs, third place was Rick Klanke with a weight of 16.14 lbs. 4th place went to Glen Phegley with 15.60 and 5th place went top Brent Ausbrook with 12.83 lbs. Big bass was also awarded to Jeff Scott for catching a really nice 6.13 lb pound large mouth. This division’s next tournament will be April 4th on East Fork Lake, near Olney Illinois. From Division 68 Central Illinois on 3/8/09. Jeff Scott from Sumner IL is one step closer to the ABA National Championship with a 1st Place win and $611.00 in the American Fishing Tour bass tournament held on Newton Lake this past weekend. (Newton lake has a 3-fish limit and a minimum size of 18”.) Jeff’s 3- bass limit weighed in at 14.16 lbs. Jeff had a really nice kicker fish that weighed 5.91 lbs. Second place went to Larry Pierce with a weight of 12.33 lbs., third place was Ryan Kruger ( His First event with ABA ) with a weight of 11.03 lbs. 4th place went to Steve Klein with a weight of 9.97 lbs. 5th place went to Gary Bettis ( His First event with ABA ) Big bass was awarded to Steve Klein for catching a very nice 6.44 lb. large mouth. Conditions: The water temperature was 64 at the ramp and up to 72 in the hot arm today. The air temperature was also really nice 60 in the morning and up to 70 in the afternoon. The water clarity was near perfect in most areas of the lake. You could see about a foot deep or more in some locations. The bass were definitely locked on the beds in some areas. Wind was the main topic Sunday. We had winds up to 30 mph at times which made casting in some locations difficult at best. Winning Strategy: Jeff was using a Brush hog with some green on the body. He was throwing his bait up on the bank at times and pulling it into the grass keeping it on the bottom at all times. Jeff said he had a great day and boated over 30 fish throughout the day. Jeff was fishing in the warm arm of the lake. This division’s next tournament will be 3/21/09 on East Fork Lake near Olney , IL. Located at the city park ramp. We are excited to announce that Grandt Rods has become our newest District # 68 sponsor. These rods are the very top of the line. The sensitivity of these rods are unbelievable. I will have some samples at the sign-in at the ramps at all events. Thanks Jim for your support this year ! Newton Lake is heating up !! I have had several reports of numerous limits being caught in a day of fishing. I had one report of 23 keepers caught by two anglers. Water temp at the ramp was an unbelievable 74 degrees Sunday. It looks like we are going to have a lot of fun this upcoming tournament Sunday on Newton. Weather and Water Conditions day of the tournament: The weather was tough at best. The air temps were about 30 degrees for the high but with the 25 mph winds that we had the wind chill hovered between 15-18 degrees all day. It was mostly cloudy with brief periods of sunshine. We had a hard blowing snow for about 3-hours at the start of the day ( no accumulation really). The boat decks iced up the first part of the day. The water was near perfect as far as color and visibility. But we had recently received a large amount of rain and with the rise of the water level again at Coffeen the fish seemed to have moved about 3-4’ deeper. We had 16 anglers that braved the bitter cold today on Coffeen Lake. Within a few minutes after take-off we got a blowing snow that really worked on everyone. I had even grabbed my amber lensed Ocean Wave sunglasses to try and keep the snow out of my eyes which became really annoying. The snow flakes seemed relentless at times. Fishing was tough but you could scratch out a limit if you really worked at it. Almost every angler brought fish to the scales today. The top three anglers all boated their keepers on Crank Baits of one type or another. There were a few fish caught on spinner baits, as well as rat-l-traps. There were a few also taken on jigs but that seemed to be the exception. I caught mine with a very large Crank about 8-12’ deep off of brush of one type or another. I was using a very slow retrieve bouncing the crank off of the brush and stopping the retrieve every time I bumped the brush. The fish seemed to just literally crush the bait when they hit. Congrats to Jim Carroll who took 1st place >> JIM from Hillsboro, Illinois is one step closer to the ABA National Championship with a 1st Place win in the American Fishing Tour bass tournament held on Coffeen Lake this past weekend . Jim’s Three bass limit weighed in at 6.98 lbs and were caught using a a crank bait in the upper end of the lake. Second place went to Larry Pierce with a weight of 6.44 lbs., third place was Rick Klanke with a weight of 6.37 lbs.. Big Bass was also awarded to Jim Carroll for catching a 2.76 lb. pound large mouth. The nationals lake and date have been announced. The lake is Pickwick Lake > Alabama 6-7 hour drive for most of us. I went over to Newton Lake today to check out the lake conditions and there were a large number of anglers that had decided to do the same. I spoke to several anglers that were struggling and a few that had caught nice fish. For the most part it seems the cold arm is already ruling once again. Some nice fish are being caught on shallow cranks of one type or another. The water conditions are a bit murky and with the steady stream of melting snow I expect it will get a lot worse by next weekend and hopefully start clearing up again after all of this snow melts. Also a reminder to everyone to check your safety equipment before heading to the lake . There were numerous violations that the local IDNR were having to point out to people today. A few extra minutes checking your equipment could save you a ticket and more importantly might just save your life. The air temps were 30 at take-off with a high of 40 degrees. There was about a 12 mph breeze most of the day which made it chilly if you were out in the wind. It was mostly sunny though which really made a nice day of fishing on the water. The water was slightly stained and 48 degrees on the main lake. It was a beautiful day on the water to start District # 68’s first event of the year. We had 18 anglers that braved the snow sleet and ice covered roads to come out and fish this weekend at Coffeen lake. Despite the tough conditions , fish were being caught in a variety of ways. There were some caught on jigs as well as flukes , cranks and even some on a top water pop-r. I had one angler tell me that he caught close to 40 bass schooling in one place. Despite the tough weather conditions every angler at least caught some fish in this event. We had several new and renewing members so we do expect full fields the rest of the year. Steve Klein from Sorento took 1st place with three fish that weighed 7.50lbs. Mike Buchanan took 2nd place with 7.35 lbs. and he also had big bass that weighed 3.19 lbs. Jim Matesa took 3rd place with 6.23 lbs. 5 lbs. It sounds like fish are being taken on several different type baits. Rat-l-traps , Jigs , cranks and senko type baits. More anglers in the tourneys are boating fish now as the fishing seems to have picked up some. Looks like we are going to have some fun this year at Coffeen. It has been taking 13-15 lbs at team events recently. Good luck all !! Seems the fishing is starting to pick-up on both Newton and Coffeen lake. I had reports this week of as many as 13 keepers being caught on Newton in a variety of ways. Some topwater , some cranks and a few on jigs and chatterbaits. With the heavy rains that was received at Newton the bite seemed to be scattered over the entire warm water arm. From all accounts it is still not stable but the bite is getting better it seems. Coffeen > from my understanding is still very cold but the bite has picked up this past week and a few of the better fish are being caught now. The 2009 rules are posted now on the main page ! Newton lake date has been changed to March 8th instead of March 7th. took 1st place with 11.43 lbs, Colby also had Big Bass of 4.87 lbs. Jim Carroll took 2nd place with 10.67 lbs. Dave Rhodes took 3rd place with 9.55 lbs. and Jerry Dye took 4th place with 8.41 lbs. There were a few fish taken on tubes and shaky heads and even a buzzbait fish or two but RATTLE-TRAPS were the tricks of the trade again this week. There were a few taken on crank baits as well. I struggled all day to catch a keeper and had one large opportunity but lost that fish by the boat. There were some really nice weights brought in for a 3-fish limit. Our next event will be on East Fork Lake , Olney, Illinois on March 29th. WE HAD A FULL FIELD OF ANGLERS TODAY !!! Despite the foul weather / cold temperatures and Ice on the roads and ramps The ABA ( American Bass Angler) Anglers again came out in full force. Ryan Faust takes 1st place with 11.75 lbs. Ryan caught his fish 12-14’ deep on a chrome rattle-trap on a drop-off. He was stopping the trap and starting it again when they hit. The Fishing started out Fast and Furious in the boat I was riding in at least for my partner, Russ Rensing. Russ took 2nd place with 7.65 lbs. He boated 6 fish very quickly on rattle traps and then I had to break down and Tie one on. I boated several really quick myself and then lost the only White rattle-trap I had with me. After that I resigned to being net boy the rest of the day for my partner. 3rd place went to Earnest Smith with 7.32 lbs. Earnie was also throwing a rat-l-trap. Charles Lett took 4th place & Big Bass with a 5.15 lb fish. There were some fish being caught on Spinnerbaits and a few on jigs but the fishing was very, very tough. We had 20 anglers and only 1-limit brought to the scales today. Most anglers caught fish but they just did not measure the 18” minimum required on Newton Lake. OUR NEXT EVENT WILL BE SUNDAY 3/2/08 on Coffeen lake, take-off will be at safe light. New members can join at the ramp at any District # 68 event but you must be at the ramp ½ hour before safe light. All one day events are $70. Boaters and Non-boaters are all equal. This should be an exciting year. We are expecting full fields throughout this year. As you can see by the results it was tough out there this week. We had 20 anglers and only one limit brought to the scales. The entire weight of all anglers fish was 59.49 lbs., That's a tough day on Newton. Most fish were caught on a rat-l-trap in the grass. 2/17/08 Newton Lake Fishing Report >> Rick Klanke I have received at best sketchy reports on Newton this past week. I know there were some smaller fish being caught on cranks. Also I know of at least one 20 lb. bag of 5-fish brought in which were taken on a jig. With the murky water conditions I still have to believe that a spinner bait would be a great choice for this weekends ABA tourney on Newton. The good news is we received some much needed rain in some areas, the bad news is we received it all in one day. It was reported to me today that Newton was like fishing in chocolate milk. There were still fish being caught even in the tough conditions. Spinnerbaits and large shallow cranks were the rule. The lake water temps have dropped about 10 degrees in the last couple of weeks so with the muddy waters and the falling temps we are going through a bit of a slow down right now but I really expect a huge turn-around in the next couple of weeks. Our next American Bass Anglers ( ABA) tourney is on Newton on the 23rd and I fully expect it to take 3-fish of 15 plus pounds to win it. I think the water will clear somewhat and it will be won on either a spinnerbait or slow moving plastic bait of some type. It was a chilly 17 degrees at the start of the day with a very heavy frost. The air temp ended up right at 40 degrees late in the day. The water was clear to stained, Water visibility in places was approximately 3’. The water Temp at the ramp was 55 degrees and up the hot arm up to 67 degrees. Winds were light at take-off and worked up to about 20 mph by the end of the day. Director's Report: Coffeen Lake lived up to its reputation again today producing large numbers and large bags of fish as well. The lake limit on Coffeen is 3-fish 15” long, so to catch a 12Lb bag of fish is really outstanding. Congrats to John Wright who took 1st place with a 12.00 lb bag of fish. Larry Pierce took 2nd place with 10.75lbs and Larry also took Big Bass with a 4.44lb fish. Coming in 3rd place was Mike Kershaw with a nice bag of 8.23 lbs. of fish and a very close 4th place went to Dave Riggs with 8.21 lbs. We had 7 out of 12 fishermen that had a limit today and 3-others that had 2 fish each. Needless to say the fishing was great today. I personally had my first limit by 8:45 a.m. and culled all day. I had several other members tell me that they had 4-5 limits of fish each today. Most fish were being caught on cranks of one sort or another. The general consensus was it just needed to be a crank. The type of crank varied greatly from angler to angler. 1/29/08 Midwest regional announcement: Will be held this year on Lake Barkley, Kuttawa , Ky>> Oct . 10-11th. The launch site is Kuttawa / Lyon County. 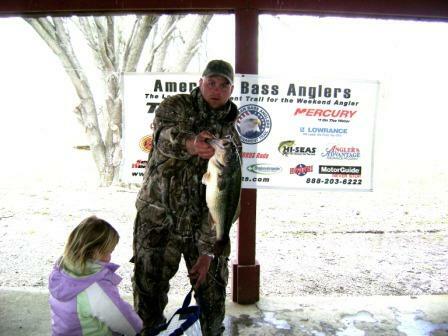 1/20/08 FISHING FEVER >> has already began this year with several area tourneys already the past couple of weeks. Coffeen lake has been HOT the last couple of weeks. Last week with 2 degree temps in the morning there were 39 boats/78 fishermen and 18 limits of bass brought to the scales. That is truly an amazing 46% of the field catching limits of fish. The water temp at the ramp was 51 degrees and up to 70 in the ditch. Most have the fish have been taken on cranks of one sort or another over the weeds in 4-6’ of water. American Bass Anglers Division # 68 will kick-off their first tourney of the year this weekend at Coffeen lake 2/3/08. 1/27/08 Newton lake has slowed some the past few weeks but there are still 17-18lb bags of fish being caught. This past week a 17lb bag won the tourney at Newton on Sunday. This page will contain the latest fishing news that I have. I will try and keep it up to date but please send any information on tourneys that you have fished and pictures where possible and I will be happy to add them. 1st Place 15.35 lbs. 3-29-08. Glen Phegley From Division Central Illinois District # 68 on from is one step closer to the ABA National Championship with a 1st Place win in the American Fishing Tour bass tournament held on Lake this past weekend. Glen’s 3-bass weighed in at 10.56 lbs. Second place went to Kevin Arbaugh with a weight of 10.18 lbs., Third place was Matt Bennett with a weight of 7.73 lbs. Jeff Lee had the Big Bass of the event which weighed 5.15 lbs. Conditions: It was another windy cold winter / spring day. It was not a nice day to be on the water. It did warm up the last hour of the day but until then it was just nasty. The water temps were around 58 degrees and the bass were locked up and not cooperating. Winning Strategy: Glen found his fish suspended around bedding areas and was sight fishing for them. ALEX WHITE From Division Central Illinois District # 68 on from is one step closer to the ABA National Championship with a 1st Place win in the American Fishing Tour bass tournament held on Lake this past weekend. ALEX’s HUGE BASS weighed in at a Whopping 7.94 lbs. Second place went to John Travis with a weight of 6.86 lbs., Third place was Glen Phegley who actually caught a Huge Bass as well which weighed 6.53 lbs. Alex’s Big Bass Won the whole event. On a very tough day of fishing there were some amazing fish caught. Conditions: 15-25 mph winds with water temps hovering around the 56 degree mark. Winning Strategy: Alex caught his huge fish on a jig. Glen caught his large bass on his trusty rat-l-trap. Conditions: Really cold at take-off with a very slow warm up to the day. Winning Strategy: Brent’s used jigs to beat out the field this week in shallow warmer coves. Alex White is one step closer to the ABA National Championship with a 1st Place win in the American Fishing Tour bass tournament held on Lake this past weekend. Alex’s bass weighed in at 11.14 lbs. Second place went to Glen Phegley with a weight of 8.67 lbs., Third place was Rick Klanke with one fish that weighed in at 6.51 lbs. This fish also captured the Big Bass honors of the event. Conditions: It was 57 degrees at 7 a.m. and 37 degrees at 10:00 a.m. with a 15-20 mph wind. The temps combined with the winds were brutal on the anglers but there were some very nice fish caught. Congrats to all and Good Luck ! For more information on this or any future event in this division contact Rick Klanke at 217-690-1659 or by email at: rtklanke@wabash.net. Kevin Arbaugh From Central Illinois District # 68 is one step closer to the ABA National Championship with a 1st Place win in the American Fishing Tour bass tournament held on Newton Lake this past weekend. Newton has a 3-fish limit of 18” minimum. Kevin’s 3-bass weighed in at 13.31 lbs. Kevin topped it off with the Big Bass of the tourney which weighed 5.79 lbs.Second place went to Alex White with a weight of 12.13 lbs., Third place was Ryan Boswell with 2-fish that weighed 7.14lbs. Conditions: The weather was bitter 19 degrees at take-off. We had light winds and the sun did show itself but reels were still icing up until 1-p.m. so it was tough weather wise. The high was 37 degrees. The lake was heavily stained and 54 degrees at the ramp with water around 65 degrees in the hot ditch nearer the Power Plant. It was tough to get bites the fish were very slow to take a bait. Winning Strategy: Kevin , caught his fish throwing a rattle –trap in shallow water up in the hot arm. Kevin Arbaugh From Central Illinois District # 68 is one step closer to the ABA National Championship with a 1st Place win in the American Fishing Tour bass tournament held on Newton Lake this past weekend. Kevin’s 3 bass weighed in at 14.25 lbs. Second place went to Mike Black with a weight of 12.79lbs., Third place was Mathew Jackson with a weight of 12.21 lbs. Kevin had the Big Bass of the event which weighed 5.60 lbs. Conditions: 22 Degrees at take-off with light winds. The air temp rose above 32 degrees about noon with a high of 37 degrees. Reel guides were freezing up all day but there were some active fish to be had. Kevin caught his bass with 3-different types of lures. Kevin said he had 7 keepers throughout the day. Winning Strategy: Kevin used rat-l-traps, jigs and cranks to catch his limit. Kevin Arbaugh Wins Big at the ABA Championship and Takes First Place at East Fork Lake, IL. With this weekends win- Kevin also won the District 68 Angler of the Year Title. He will compete this fall against other top finishers for a brand new Triton Bass Boat. Kevin is one step closer to the ABA National Championship with a 1st Place win and $ 562.00 in the American Fishing Tour bass tournament held on East Fork Lake this past weekend . Kevin’s 10 bass limit weighed in at 29.88 lbs Second place went to Chris Rush with a weight of 24.85 lbs third place was Joey Gallagher with a weight of 23.13 lbs. BIG BASS went to Mike Buchanan who caught a nice 5.89lb bass. These anglers are acquiring valuable points to insure their birth in division’s two-day champion and the American Fishing Tour National Championship that will be held this fall. Their points are also being used to determine the divisional angler of the year. The top angler by points earned in this division will represent the division in the Angler of the Year final round. Conditions: It was blasting hot ! It was the hottest weather I have seen in years. 107 degrees. The humidity was high and bright sunny skies on day one. Day 2 was a lot better a high of 97 degrees and some cloud cover and wind at times. Still with the hot conditions these anglers found a way to catch fish. Winning Strategy: Kevin’s winning strategy was throwing cranks around deeper humps and along grass lines. Rick is one step closer to the ABA National Championship with a 1st Place win and $ 299.00 in the American Fishing Tour bass tournament held on East Fork Lake this past weekend . Rick’s 5 bass limit weighed in at 18.55 lbs Second place went to Mike Buchanan with a weight of 13.01 lbs. Third place was Gruen Vonbehrens with a weight of 11.88 lbs. BIG BASS was also caught by Rick Klanke a 6.14 lb largemouth. We had no dead fish today! We turned the livewells on before leaving the dock at take-off and kept them running all day. These anglers are acquiring valuable points to insure their birth in division’s two-day champion and the American Fishing Tour National Championship that will be held this fall. Their points are also being used to determine the divisional angler of the year. The top angler by points earned in this division will represent the division in the Angler of the Year final round. Conditions: It was HOT ! 107 degrees by days end. Water temps were 83 degrees. Sunny skies but a light wind did help. Winning Strategy: Rick’s winning strategy was fishing grassy areas. It was an awesome day. I started out Carolina fishing deep points in some grassy areas and by 9 a.m. I had 5 keepers. I culled several times but still brought in 2-16inch fish. I had the 6.14 lb fish and 2-others right at 5 lbs. Sadly, if I had not lost a couple of fish at the boat I would have had 27 lbs. ( My 8-year old little girl Jacy and I had a kids tourney on Sunday and she actually hooked a 6lber as well. She won that event also. ) It was miserably hot but the fishing is awesome right now. Next weekend’s Championship should be a blast. I think there will be a giant bag of fish caught at least on day one if not both days. It will be an exciting event to fish. Jeff is one step closer to the ABA National Championship with a 1st Place win and $ 382.00 in the American Fishing Tour bass tournament held on East Fork Lake this past weekend . Jeff’s 4 bass weighed in at 10.65 lbs Second place went to Joey Gallagher with a weight of 8.61 lbs. Third place was Kevin Arbaugh with a weight of 8.33 lbs. Big Bass was caught today By Kevin arbaugh who had a 3.93 lber. These anglers are acquiring valuable points to insure their birth in division’s two-day champion and the American Fishing Tour National Championship that will be held this fall. Their points are also being used to determine the divisional angler of the year. The top angler by points earned in this division will represent the division in the Angler of the Year final round. Conditions: Temps were great for the fishermen until about 10:00 a.m. then they moved up to the 100 degree mark. Sunny bright skies with very little wind. Water temps were around 77 degrees. Winning Strategy: Jeff’s winning strategy was using his jig in and around grass at 10-15’ deep. In other News there was a 8.85lb bass caught at Forbes lake in a local bass club tourney this past weekend. 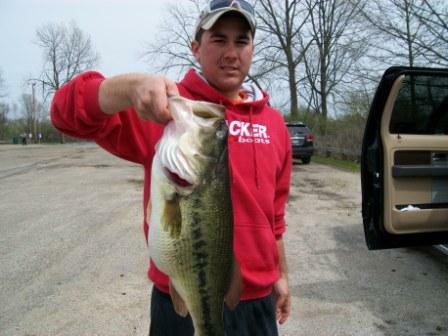 Thats the largest bass I have ever heard of being caught in a bass tourney here in Illinois. Kevin is one step closer to the ABA National Championship with a 1st Place win and $ 420.00 in the American Fishing Tour bass tournament held on East Fork Lake this past weekend . Kevin’s 5 bass limit weighed in at 17.15 lbs Second place went to Brent Ausbrook with a weight of 12.85 lbs. Third place was Leo Reiter with a weight of 9.85 lbs. The Big Bass Award also went to Kevin Arbaugh who had a 4.16lb bass. These anglers are acquiring valuable points to insure their birth in division’s two-day champion and the American Fishing Tour National Championship that will be held this fall. Their points are also being used to determine the divisional angler of the year. The top angler by points earned in this division will represent the division in the Angler of the Year final round. Conditions: The weather was beautiful light winds and sunny skies. It was very hot 70 degrees at start of day and rising to 91 degrees by mid-day. Winning Strategy: Kevin’s winning strategy was using a custom made pop’r over shallow bedding fish that were guarding fry. Kevin is one step closer to the ABA National Championship with a 1st Place win and $ 430.00 in the American Fishing Tour bass tournament held on East Fork Lake this past weekend . Kevin’s 5 bass limit weighed in at 12.38 lbs Kevin caught his fish with a pop’r over shallow grass. Second place went to John Jones with a weight of 10.65 lbs. Third place was Leo Reiter with a weight of 9.34 lbs. BIG BASS of 5.41 lbs went to John Jones Who Credited his catch to his local sponsor Gilley Jigs. These anglers are acquiring valuable points to insure their birth in division’s two-day champion and the American Fishing Tour National Championship that will be held this fall. Their points are also being used to determine the divisional angler of the year. The top angler by points earned in this division will represent the division in the Angler of the Year final round. Conditions: It was a cool take-off this morning with temps right at 40 degrees. The water temps were at 62 degrees and steadily falling so it was very tough conditions. A lot of the bass were wanting to spawn and the cold front has definitely delayed them and pushed them back out some. Winning Strategy: Kevin’s winning strategy was throwing a pop’r over grassy bedding areas. Chris is one step closer to the ABA National Championship with a 1st Place win and $ 393.00 in the American Fishing Tour bass tournament held on Coffeen Lake this past weekend. Coffeen Lake was a blast for everyone this past weekend. Every angler caught their limit of bass! Coffeen Lake is well known for numbers of fish and it definitely supplied that to the anglers this weekend. Chris caught his 3 bass limit weighing in at 7.31 lbs. He credited his win to Prairie Outfitters his local sponsor for supplying all of his tackle needs. Chris Caught his fish on a jig and said that he had culled 10 big fish today. Second place went to Joey Gallagher with a weight of 6.74 lbs. Third place was Ernest Smith with a weight of 5.75 lbs. BIG BASS was also awarded to Chris Rush who caught a 3.99lb Largemouth bass. These anglers are acquiring valuable points to insure their birth in division’s two-day champion and the American Fishing Tour National Championship that will be held this fall. Their points are also being used to determine the divisional angler of the year. The top angler by points earned in this division will represent the division in the Angler of the Year final round. Conditions: The weather was beautiful and the water on the main lake at 75 degrees and slightly stained. The fishing was fanatastic. I was culling an hour after take-off and managed to cull 12 times throughout the day. It was an awesome day to be fishing. Winning Strategy: Chris’s winning strategy was throwing shallow with his jigs supplied to him by his local sponsor Prairie Outfitters. Gruen is one step closer to the ABA National Championship with a 1st Place win and $ 484.00 in the American Fishing Tour bass tournament held on Newton Lake this past weekend . Gruen’s 3 bass limit weighed in at 11.99 lbs Second place went to Scott Ham with a weight of 11.92 lbs third place was Chris Rush with a weight of 10.72 lbs. Fourth Place was Mike Buchanan with 2-fish that weighed 7.93lbs. BIG BASS was Joey Gallagher with a 5.10 Largemouth Bass. These anglers are acquiring valuable points to insure their birth in the division’s two-day champion and the American Fishing Tour National Championship that will be held this fall. Their points are also being used to determine the divisional angler of the year. The top angler by points earned in this division will represent the division in the Angler of the Year final round. Conditions: The weather was beautiful today with little wind and partly sunny skies and 70 degrees by days end. The water temps were around 72-74 degrees over most of the lake. The fishing was tough for most but there were a few as always that had them figured out. Most were catching them shallow in the grass and around wood using soft plastics and jigs. Larry is one step closer to the ABA National Championship with a 1st Place win and $ 468.00 in the American Fishing Tour bass tournament held on Newton Lake this past weekend . (Newton Lake has a 3-fish maximum 18” minimum size limit.) Larry’s 3 bass limit weighed in at 13.31 lbs Second place went to Mike Buchanan with 2-fish a weight of 6.55 lbs third place was Dennis Carder with one fish that weighed 5.59 lbs. Dennis also had the BIG BASS of the tournament. The Fishing was very tough today the fish were just locked up from the cold front and heavy winds from previous days. Although the weather was beautiful for the anglers the fish were still transitioning and were caught at a variety of depths and lure presentations. We had one limit and one person caught 2-fish today with half the remaining field catching one keeper fish. Conditions: We started out with light winds and 27 degree air temps, which quickly rose into the 50’s and sunny skies. Winds were steady about 10-15 mph all day, It was a beautiful sunny spring day. Winning Strategy: Larry caught his winning weight on a lizard and other creature baits. The 2012 Schedule is now complete. I have been working a lot and not had any time to fish but for all you die-hards out there I have been told that Coffeen lake is at 61 degrees as of 1/2/11. This years events will start out at Newton Lake for the first 2 events. ( March 10th and 24th) then Coffeen( April 7th). Then East Fork for the last 4-events. as well as the championship at East Fork as well. Ending this year on July 7th and 8th with the 2-day Championship. With the dates we have lined up for 2012 there should be some really nice catches of bass this year. It should be an Exciting Year! See ya all out there !! !